The chambered tombs and long barrows of Britain have long tickled the imagination, and perhaps none more so than Wayland’s Smithy. Perhaps it’s the stand of beech trees enclosing it which makes it feel more intimate, more hushed. 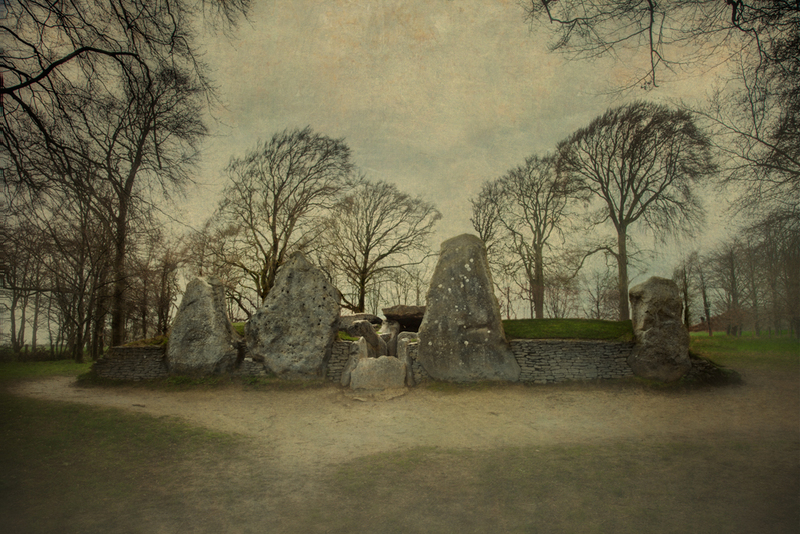 Unlike West Kennet Long Barrow near Avebury, sitting exposed to the wind and the rain, high on a ridge, Wayland’s Smithy can feel at once comforting, or oppressive, depending on one’s mood and perhaps the weather. I visited it on a soft day, light rain falling in mid April. The trees had yet to fill out their branches with leaves, and when we arrived there was a family having a picnic near the entrance, as well as some hikers taking a rest at the back. It was already a tense day, so perhaps my mood was colored by that. I’d seen photos and in those it looked quite inviting, beautiful even in its pastoral beauty. On this day however, it felt more like what it is. The idea that the ruins which confronted 19th century visitors to Wayland’s Smithy were caused by the destruction of the forge of a pagan god stretches back to the days before Christianity replaced pagan beliefs, as the story of Wayland the Smith dates at least to the tenth century. Wayland’s Smithy is a Neolithic long barrow and chamber tomb, nestled inside a grove of beech trees, near Whitehorse Hill in Oxfordshire, not far from the village of Ashbury. It sits just off the Ridgway, one of the ancient tracks of Neolithic Britain, upon which people used to move throughout the countryside. 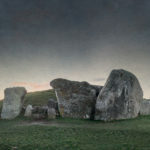 It sits just downhill from the Iron Age Uffington Castle, a breathtakingly situated earthwork hillfort, and the more famous Uffington White Horse. Wayland’s Smithy was constructed in two phases, a short time apart, the first being built between 3590 and 3555 BC. Britain, perhaps following the lead of their continental counterparts was moving at the time from hunter gatherers to farmers, and a more pastoral lifestyle somehow prodded the Neolithic people to construct impressive houses for their dead. Much has been made about astronomical alignments in the construction of prehistoric British monuments. 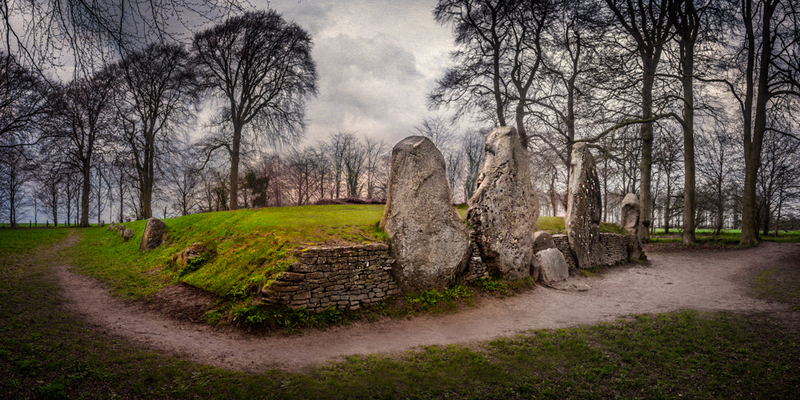 The long barrow of Wayland’s Smithy runs north and south, with two burial chambers flanking the main passage, aligned east and west. Technically, it’s a bit off center, which might have had some relevance, as the second phase of construction kept the original alignment. The first phase of construction of Wayland’s Smithy was built on slabs of sarsen stones, and consisted of a narrow, lidded wooden box, in which the remains were placed. At either end were two tree trunks, split in two and placed upright, which have been interpreted as the supports for a roof like structure over the box containing the cadavers. Nearby, post holes provide evidence for a platform which might have been used to expose the bodies to the elements, quickening decomposition and reducing them to bones prior to burial. Fourteen sets of remains were found, eleven men, two women and a child, and some at least appeared to have been buried intact, with at least tendons and cartilage holding the bones together. One body was found to be interred in a crouching position. The others were stacked like a cord of wood, though as noted, quite likely devoid of flesh and reduced to bones. Three of the bodies might indicate death in combat, though it’s debated whether the arrowheads were lodged first in the body and exposed by decomposition, or added later as previously thought, as grave offerings. Two of the bodies appeared to have been partially eaten by scavengers prior to burial, also pointing to the possibility of death in battle. The life span of this first phase of Wayland’s Smithy appears to have been only about fifteen years, something within the time frame of 3590-3550 BC. It’s also possible, if not especially likely, that it was used for as short a time as a single year. Afterwards, an oval mound was built over the complex consisting of chalk extracted from ditches dug on either side, completely burying it. The original construction of Wayland’s Smithy lies buries about halfway down the length of the long barrow. About a half century later, about 3460 and 3400 BC, the people living in the vicinity of Wayland’s Smithy decided to revisit what came before, and built a larger, more elaborate structure over the top of the previous. 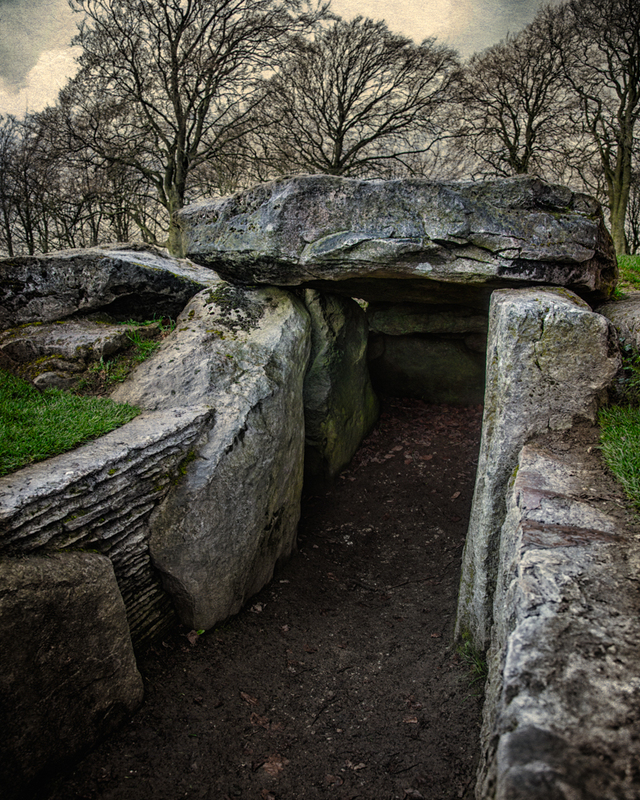 What they built was a type of construction long known to this part of the country, and indeed on the way out, as Wayland’s Smithy is one of the last, and best preserved long barrow chamber tombs in Britain. The long barrow was wedge shaped, a hundred and eighty feet long, forty eight feet wide at the front and twenty feet wide at the rear. 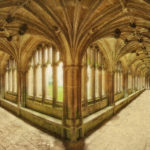 It was built up with chalk to a height of ten feet and contained a main passage, with side chambers forming a prehistoric crucifix on the inside. The main passage was twenty two feet long and six foot high inside, with the side chambers being four and a half feet high. Two long ditches, fifteen foot wide and six foot deep flanked the sides, with sarsens set up as curbstones along the edges of the barrow. Split tree trunks were set upright along the ditches like totem poles from the native Americans. But it’s the facade of Wayland’s Smithy that attracts attention. The front of the barrow had a dry stone retaining wall, and in front that stood six sarsen stones, about ten foot high. Today there are only four remaining, but the effect is still staggering. The remains found in the second phase of building were more scattered and nearly impossible to learn much from. They found the skeletons of seven adults and a single child. Though it’s hard to say for sure if it was intentional, or just a freak coincidence, three leaf shaped arrows were found, each touching the pelvis bone of different bodies. Dating of the remains found that the second phase of Wayland’s Smithy only lasted about a hundred years, before it was sealed off. 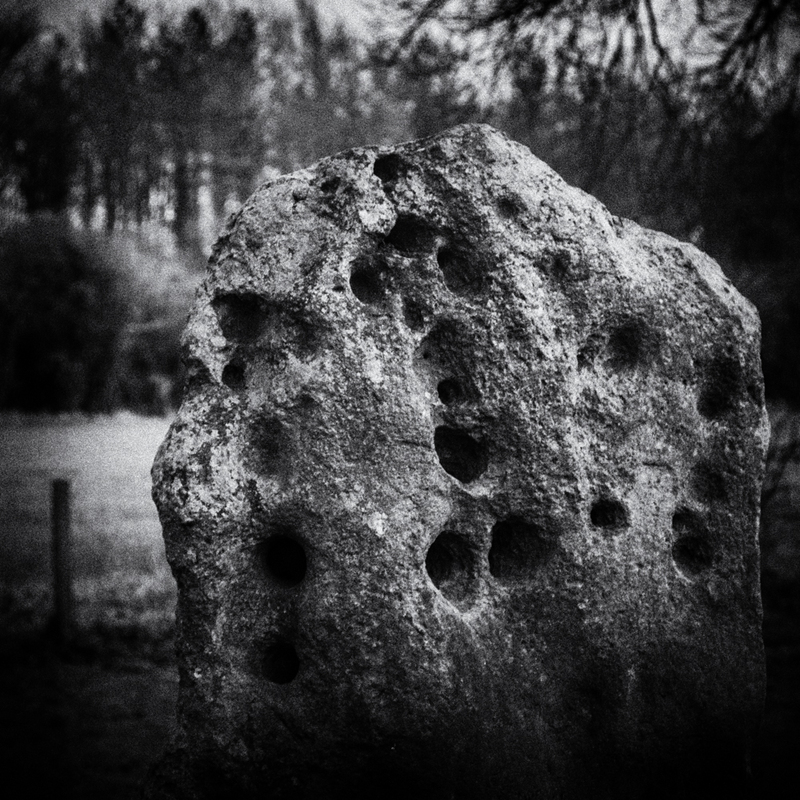 Though often thought to be intentional, the cause of the holes sometimes found in sarsen stones are in fact the result of geological forces, and were likely chosen by the builders for this unique characteristic. No one knows why. Curiously, two Iron Age pieces of metal were found in the barrow, perhaps unfinished swords, or maybe bars used for currency. Either way, iron working become forever connected to the site in folk legends. The first written mention of Wayland’s Smithy occurs in a charter dating from 955 AD, during the reign of the Saxon King Edred with refers to it as Weland’s Smithy. The name seems to refer to a Saxon god, Wayland or Wolund, who was a smith, one who worked in metal. The Saxons who inhabited the area had no clue the site was already four thousand years old when they dedicated it to their own god. But in the folklore handed down to the recent past, Wayland actually proves to be quite helpful to the local inhabitants. Francis Wise, an eighteenth century antiquarian composed a letter to one Doctor Mead in 1738, describing the folklore of Wayland’s Smithy. “At this place lived formerly an invisible Smith; and if a traveller’s Horse had lost a Shoe upon the road, he had no more to do, than to bring the Horse to this place, with a piece of money, and leaving both there for some little time, he might come again and find the money gone, but the Horse now shod. The stones standing upon the Rudge way as it is called; (which was the situation, that they chose for burial monuments) I suppose, gave occasion to the whole being called Wayland-Smith; which is the name it was always known by to the country people. “What do you mean by such folly?” said the traveller, beginning to be angry with the boy, and vexed with himself for having trusted such a hare-brained guide. The young man with Sludge is dubious of his claims, and fears the loss of his money, and refuses to call to Wayland Smithy for service. Tressilian, musing what the upshot of this mummery was to be, yet satisfied there was to be some serious result, by the confidence with which the boy had put himself in his power, suffered himself to be conducted to that side of the little thicket of gorse and brushwood which was farthest from the circle of stones, and there sat down; and as it occurred to him that, after all, this might be a trick for stealing his horse, he kept his hand on the boy’s collar, determined to make him hostage for its safety. “Now, hush and listen,” said Dickie, in a low whisper; “you will soon hear the tack of a hammer that was never forged of earthly iron, for the stone it was made of was shot from the moon.” And in effect Tressilian did immediately hear the light stroke of a hammer, as when a farrier is at work. The singularity of such a sound, in so very lonely a place, made him involuntarily start; but looking at the boy, and discovering, by the arch malicious expression of his countenance, that the urchin saw and enjoyed his slight tremor, he became convinced that the whole was a concerted stratagem, and determined to know by whom, or for what purpose, the trick was played off. Accordingly, he remained perfectly quiet all the time that the hammer continued to sound, being about the space usually employed in fixing a horse-shoe. But the instant the sound ceased, Tressilian, instead of interposing the space of time which his guide had required, started up with his sword in his hand, ran round the thicket, and confronted a man in a farrier’s leathern apron, but otherwise fantastically attired in a bear-skin dressed with the fur on, and a cap of the same, which almost hid the sooty and begrimed features of the wearer. “Come back, come back!” cried the boy to Tressilian, “or you will be torn to pieces; no man lives that looks on him.” In fact, the invisible smith (now fully visible) heaved up his hammer, and showed symptoms of doing battle. View of the interior chambers of Wayland’s Smithy. 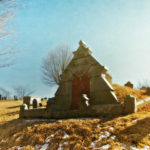 Of course, a remote, ancient burial chamber will be the source of ghost stories and sightings as well. Children still reported hearing the sounds of hammering coming from Wayland’s Smithy, as recently as the nineteenth century. The Uffington White Horse was believed to leave his hillside on occasion to have new shoes at the long barrow. A recent sighting spotted a figure on the track leading to Wayland’s Smithy, his feet and legs disappearing into mist. As the witness turned his head and then back to the mysterious figure, he found it had disappeared, vanished. 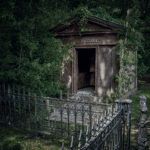 Feelings of being watched while at Wayland’s Smithy are common, as are oppressive feelings, weighing down upon visitors. Others, particularly those entering the chamber report a feeling of not being wanted in there. 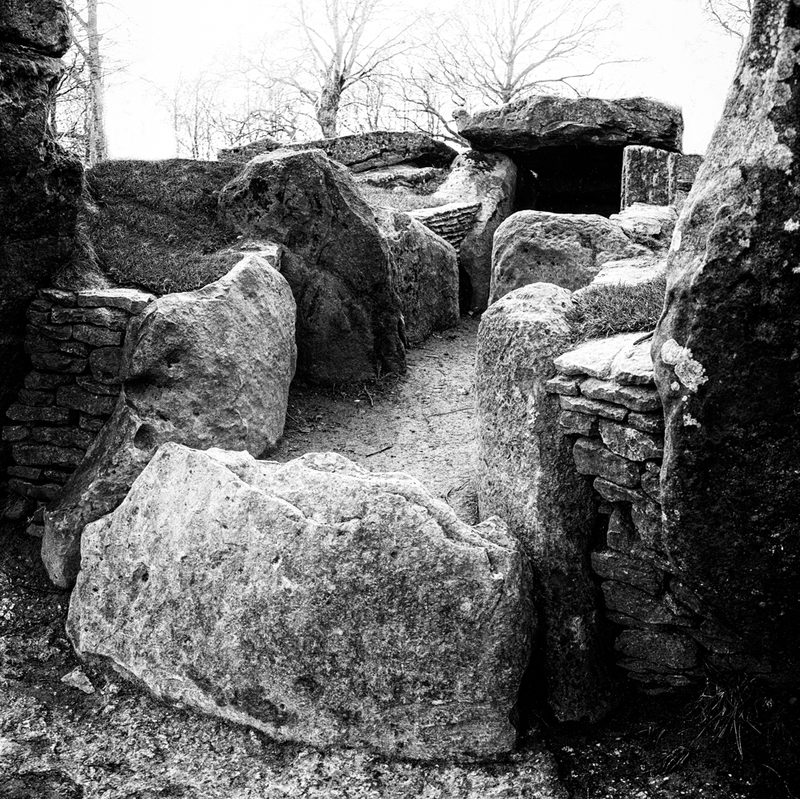 Though the deity to whom the long barrow and burial chamber gives his name is long forgotten by most, people still remember to leave tokens for him, pushing coins into the cracks of they dry stone wall which lines the front of Wayland’s Smithy. The mystery of where those coins disappear to is easily solved however, as workers for The National Trust collect them and give them to local charities. And in this way, the story of Wayland Smithy lives on, and the mysterious smith in the barrow still helps the locals to this day. 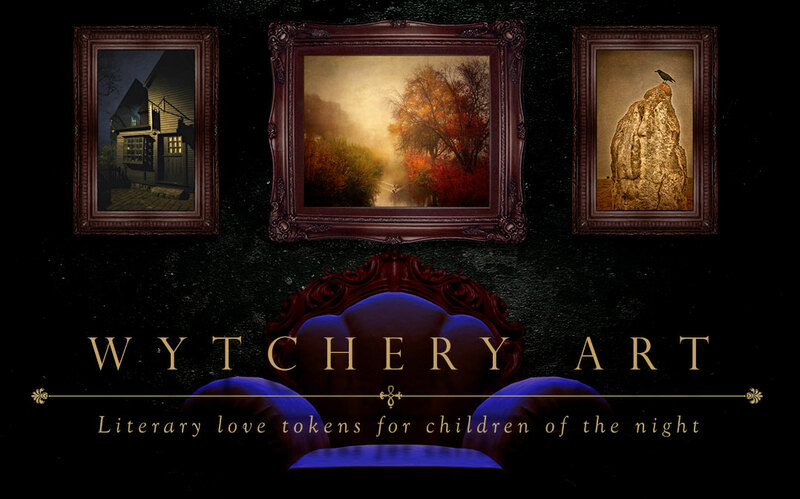 View a gallery of images of Wayland’s Smithy and Whitehorse Hill at Wytchery Art.